Designers of mixed-use developments are focusing on placemaking to deliver meaningful experiences. More than 50 stories tall, the mixed-use tower will activate downtown Tampa with high-end condominiums and street-level retail, cafés, and restaurants. A new promenade and access to an adjacent park that hosts downtown events will connect the project to the city and the waterfront. As more people turn to technology for their daily transactions, designers are harnessing the principles of placemaking to shape mixed-use environments that offer more meaningful experiences. CAN WE CREATE MIXED-USE PROJECTS THAT CONNECT PEOPLE TO THE SOUL OF THE CITY? In my work as a mixed-use practitioner, I’m constantly aware of the importance of the public realm in making great cities that are layered with experience. I’m talking about the plazas, courtyards, passageways, sidewalks, and parks — the in-between spaces that serve as the connective fabric weaving together the threads of a city and its people. To me, these interstitial spaces are where a city’s soul lives and where social interactions reside. The question I have is, can we create mixed-use projects that stitch together this connective fabric and truly connect to the soul or spirit of the city? I believe we can. After all, mixed-use developments weave together seemingly disparate typologies to create something cohesive, dynamic, and unabashedly new. As with defining the spaces in between, the focus for new mixed-use developments must be on creating a sense of place that is intimately tied to the city in which that development resides. Pedestrian paths weave between two hybrid mixed-use buildings — a 350-unit residential tower and a 425,000-square-foot office building. Both draw on the local vernacular of converted warehouses, with easy access to nearby retail, restaurants, music venues, and a market hall. During research for the Gensler Experience IndexSM, we discovered that a sense of place adds significantly to a great experience. When we work with clients on new developments, we focus on characteristics that are rooted to the place they’re in. We’ve found that this adds authenticity and allows visitors to feel connected to where they are. 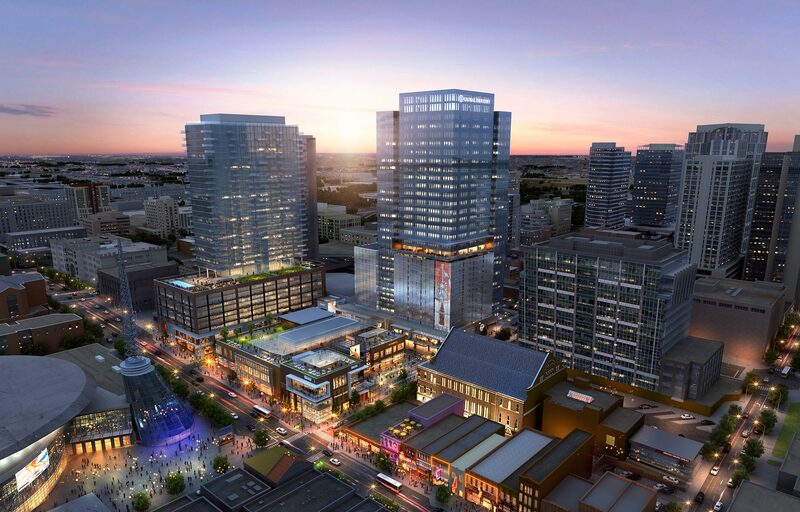 Ultimately, mixed-use projects are all about porosity and connectivity, from the connection to public transportation, to different parts of the city, to all of the components in between. These spaces or voids may be the most difficult to quantify, but they matter the most, because that’s where people gather and experience community. Mixed-use developments can also reanimate a sense of place in inner-city pockets that have fallen into decay. In fact, hybrid places are growing in popularity because they’ve been able to recalibrate traditional land planning practices and address the influx of urban populations. This mixed-use development is tailored to the Changning district’s reputation as an arts and culture hub. The two office buildings are lifted above the new retail podium to create community space that can host events and exhibits. 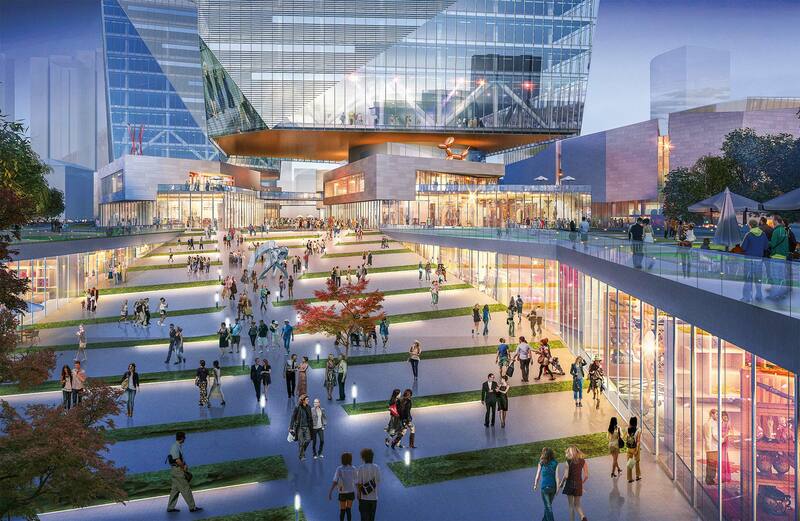 We also introduced a sunken plaza lined with boutiques and artists’ studios that enrich the district. The spaces in between the buildings of mixed-use projects are key to creating a sense of place. These spaces or voids may be the most difficult to quantify, but they matter the most, because that’s where people gather and experience community. Gensler’s multiyear Spaces in Between research examines this overlooked aspect of city-making. We identified six elements — nature, community, human scale, culture, connectivity, and art — that can be blended into developments to create places with spirit and energy. When applied effectively, these elements can unlock project potential, generate higher revenues, and create more soulful spaces and, ultimately, more soulful cities. By focusing on the connections between the building, site, and city — and by being alert to the sense of place in urban settings — we can deliver the types of hybrid experiences that people expect in today’s connected world. Shamim Ahmadzadegan is a Mixed Use Leader based in Gensler's Washington, DC office.